Dr. Curtis Cooper trained at the University of Saskatchewan (MD 1994). He received certification in Internal Medicine in 1997 and in Infectious Diseases in 1999 while at the University of Manitoba. He completed an HIV Research Fellowship and Masters of Epidemiology in 2002 while at the University of Ottawa. 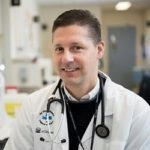 He is currently an Associate Professor with the University of Ottawa, Infectious Diseases Consultant with the Ottawa Hospital Division of Infectious Diseases, Associate Clinical Researcher with the Ottawa Health Research Institute and Director of the Ottawa Hospital and Regional Viral Hepatitis Program. As a clinical researcher, his research activities encompass HIV, viral hepatitis, and vaccine development. His work is focused on the development of new therapeutic agents and the delivery of treatment that maximizes safety, adherence and safety.